Unlike puppies, kittens are not born with worms. However, disgusting as it sounds, most kittens become infested with the cat roundworm, Toxocara cati, from their mother’s milk shortly after birth. This worm can do all sorts of damage to your new kitten’s intestines, not to mention the fact that children can become infected with it. When a cat becomes infected with roundworms, some of the worms migrate through the cat’s body, find a spot to settle down, and become dormant, a bit like a very deep sleep. There they stay, waiting for the right time to wake up and complete their migration. Usually this is via the bloodstream to the lungs, up the trachea (windpipe), then down into the stomach and onto the intestines, where they live as adult worms, laying eggs into the cat’s faeces. When a cat becomes pregnant, lots of these dormant worm larvae reactivate, and migrate to the mammary gland to infect the kittens when they start to suckle. The initial infestation of the cat may well have been when she too was a kitten, suckling from her mother. The worm eggs infest the environment that the kittens are in (generally your house or garden), ready to infect a new cat. There’s an important human health problem here as well. If the worm eggs are eaten by a person, they will infect that person. In healthy adults this is of little consequence, but in children the larvae may migrate through the child’s body, causing trouble on the way. If the child is really unlucky, a larva might end up somewhere important like the retina, and cause vision defects. First, disregard what the kitten’s breeder said about worming. Too many still worm kittens with old, inefficient wormers, or mix worming preparations into a large bowl of food and expect each kitten to get the right dose as they fight round the bowl. For the vast majority of breeders, your new kitten’s litter was the first and last litter of kittens they will ever see, so the degree of expertise in rearing kittens is very low. Second, worm your kitten with an effective preparation, as soon as possible after she comes to stay with you. For most preparations, repeat the treatment every 2 weeks until you see no more worms, then at least every 3 months for the rest of the kitten’s life. The reason for this is that every cat has dormant larvae in her body tissues somewhere. No currently available wormer can kill these, and every so often, such as during illness, some of these dormant larvae will reactivate, head for the intestines, and start laying eggs. At Vetrica we routinely use a product called Milbemax®. This is a nice, small, inexpensive, bullet-shaped tablet that is very easy to administer. It controls both roundworms and tapeworms in one dose (although tapeworms are very rare in young kittens). If you prefer, we are happy to administer the tablets for you at no extra cost. Piperazine. This is available in a plethora of formulations, such as tablets, chocolate flavoured syrup or paste. It is often sold as “Easy Wormer”, or “Puppy and Kitten Wormer”. The sad thing is, it is NOT suitable for kittens. 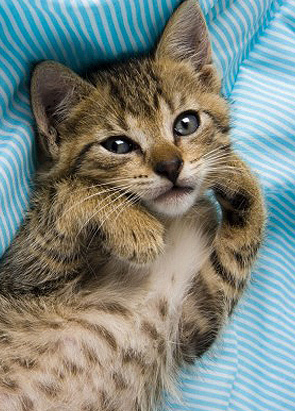 Piperazine has practically no effect on worm larvae (which we are most concerned about with kittens), and only kills about 60-70% of adult roundworms. This means that you have to worm kitten again and again and again to rid her of worms, and all the while she’s passing those dangerous worm eggs into your garden, or where-ever she goes.